Fans will be in full control of the way they consume the world’s fastest on-water racing, with the ability to personalize the boats, camera angles and data that feature in their feeds. With instant access to more than 1,200 data points from the fastest and most technologically advanced race boats and the world-class athletes who pilot them, fans will have unprecedented insight into the revolutionary new sailing league. 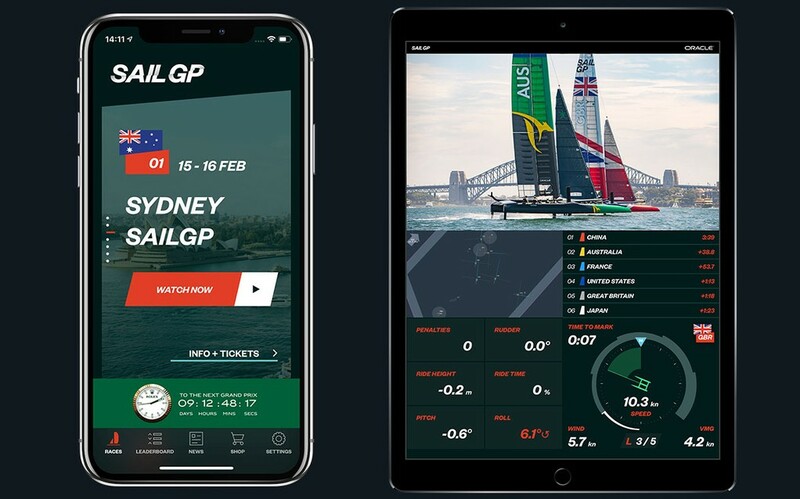 The SailGP APP allows fans to choose what to watch and which boat to follow, bringing them closer to the sport than ever before. They will be able to view live data and video (subject to regional restrictions), track performance, compare athletes, change viewing angles, zoom in on the action and watch replays. The unique split screen feature enables the viewer to compare two teams side by side, and delve into the detail of what makes the unique super boats fly. Not sure about the crews, but I’m exhausted already! But there is more . . .
Three customizable modes are designed to cater to all levels of knowledge of the sport, from emerging fans to sailing aficionados. The standard view is focused on visuals streaming in live from 11 feeds via helicopter, drone, and on-water and onboard cameras, displayed alongside key race statistics. Tips are offered to assist users in understanding the terminology and relevance of the data. Meanwhile, the advanced view allows users to hone in on precise technical data from the boat. In this setting, rudder angle, ride time, ride height, pitch and roll can all be viewed to allow fans to get under the hood of the supercharged F50 and see what it takes to perform at the highest level. Note that all this is only available if you have an Apple iOS device. For the rest of you an Android version will be available later in the season. Note also that in some areas the broadcasts will be delayed due to agreements with local broadcasters, but the app includes a ‘no spoilers’ setting for globally fans consuming the content on a delayed basis. The SailGP Sydney event is taking place Friday 15 and Saturday 16 February.